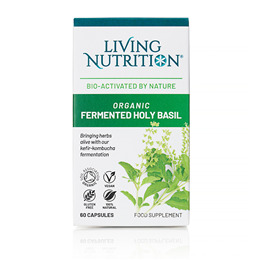 Living Nutrition`s Holy Basil Alive is 100% organic and highly bioavailable. With added organic lemon balm to increase its calming effects. Holy basil, also known as tulsi, is a primary herb used in Ayurvedic medicine. It is highly valued for its benefits to the mind, body and spirit, including emotional wellbeing and stress. Living Nutrition uses the ancient art of fermentation to create a highly active and bio-available form of basil. *(Fermented freeze dried) Holy Basil (Ocimum sanctum), *Holy Basil (Ocimum sanctum), *Lemon Balm (Melissa officinalis), Vegetable cellulose capsule (hydroxypropyl methyl cellulose). Take 1 to 2 capsules per day with or without food. 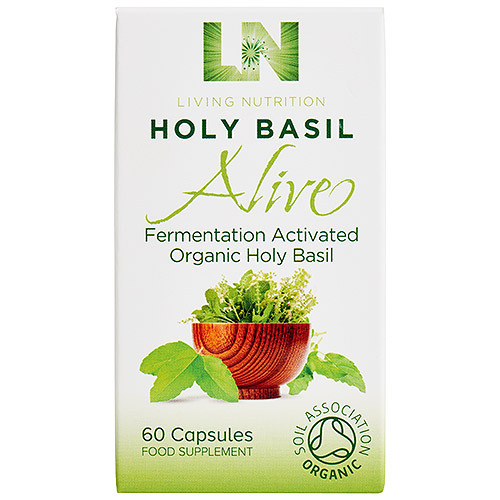 Below are reviews of Living Nutrition Holy Basil Alive - 60 Capsules by bodykind customers. If you have tried this product we'd love to hear what you think so please leave a review.